I left Kedougou into the unknown. 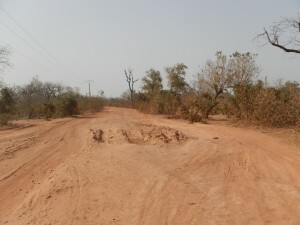 I had heard about a new road connecting Kedougou with Kita in Mali, but it is not to be found on any map. In the past maps, and especially the information provided by locals has not always been reliable, but here it was just a pure guess. Touristy Senegal pretty much finishes in Kedougou. And there, actually, the tourist infrastructure was largely used by people who were there for business. Large scale mining of gold and iron ore is planned in the area, that’s why, I heard. The road wasn’t difficult to find and it was all new, the painted white lines barely dry. My estimate was that it would take me a week to Bamako, roughly guessing from the distance on the map and past experience. My planning was poor though. The first day I cycled over hundred kilometres to the border. Albeit this was a nice achievement that day it left me with considerable fatigue for the next few days. There is not much beyond Kedougou. A few villages, and lots of emptiness, all surrounded by the never ending sea of Savannah. There are no more brick houses, just mud brick round houses. There is no electricity, no running water, not much on offer in the occasional shops. 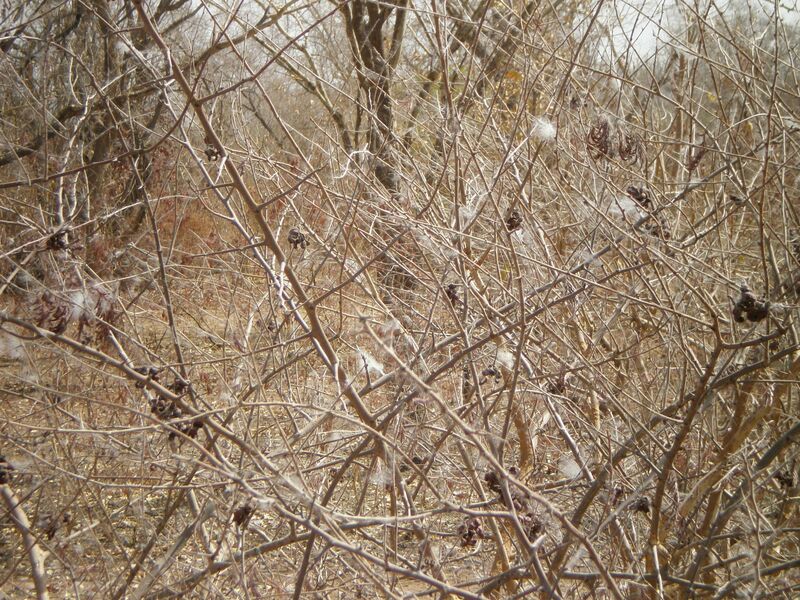 Some fluff is flying in the air and stuck to bushes, the wild cotton, I learned. The border crossing was fairly easy, I was stamped out, crossed the bridge. 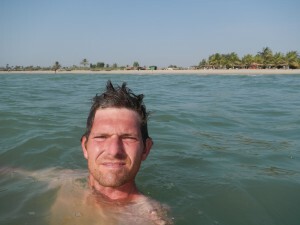 Mali officials claimed my visa was expired, but I got there finally. Another sign of the lack of tourists is there is no more asking for ‘cadeaux’. The first day in Mali saw a strong Harmattan. 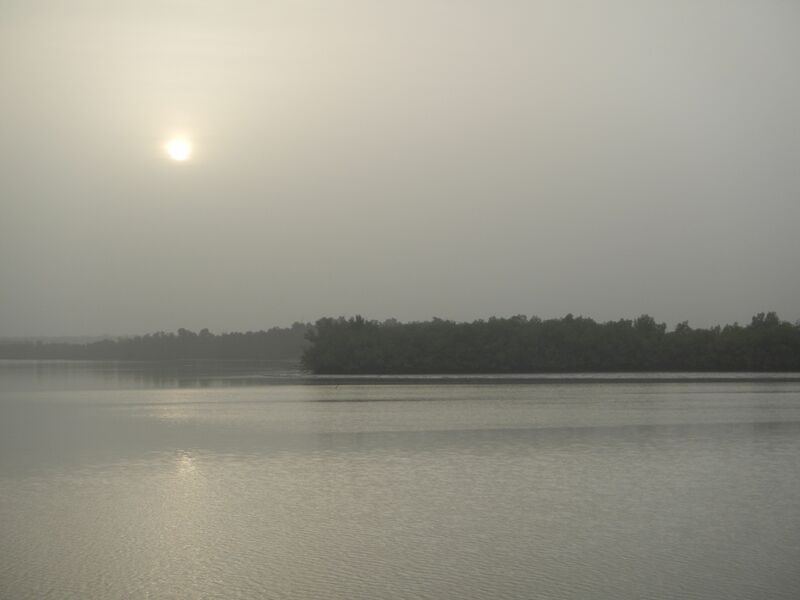 The Harmattan is a dry and dusty trade wind blowing from the Sahara to the Gulf of Guinea. During strong events the visibility is severely limited and the sun is blocked. With better visibility the route would have been quite attractive. It got hilly, and finally seriously mountainous. There was nothing signposted as such but I am sure I crossed something that would normally be referred to as a mountain pass. I took it in steps of 70 to 80 kilometres after the big first day, what was quite exhausting. Only in Kita I had a day rest. It was as well a journey against the wind. By no means was this as strong as in the Sahara, but it dragged on particularly from mid morning to mid afternoon. It seems to cease spot on sunset so that you can continue sweltering for another few hours. 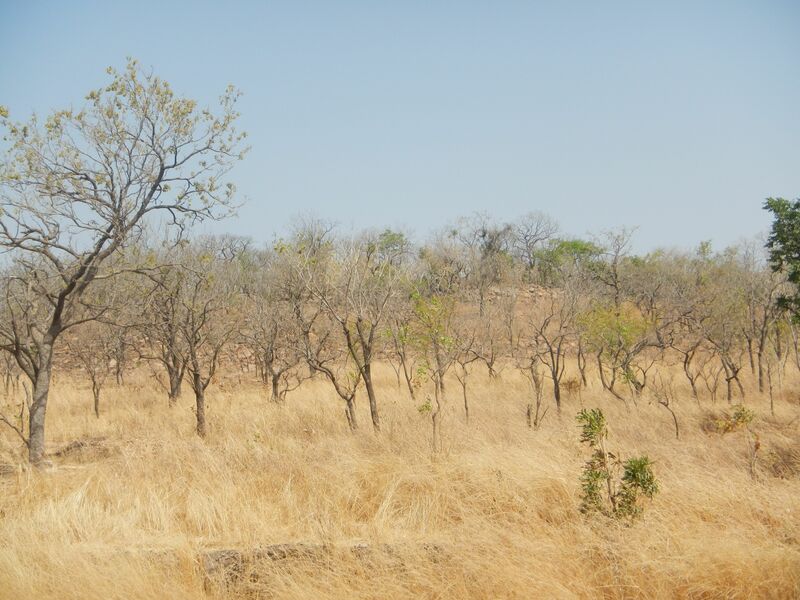 You probably didn’t need a meteorologist to tell you that it is hot in Africa. What I have experienced on this stretch is certainly beyond anything I have ever experienced in the past. By day temperatures climb to 40 degrees. It is cooler over night and in the morning however, this is strictly relatively speaking. High twenties probably. I did the bulk of the cycling in the morning, until the heat forced me off the bike in the afternoon and have a break then. Full speed, round about 20 km/hr is only possible early in the day. Yet, I sweat a lot in the morning, but from about eleven o’clock the temperature is beyond sweating, and I produce just dry salt staines. It’s bearable but uncomfortable. It is certainly a dry heat, so the internal cooling mechanism is working well. But how is this for an object that can’t sweat? Well, take my water bottles. By lunchtime, my water has about the temperature I like my Melange back home, or my cappuccino elsewhere. If I use the water I carried to wash by the end of the day it is actually too hot. Needless to say I consume a lot of water. I currently carry a bit more than four litres and I fill up three times a day, and more for the night. Virtually all the villages have communal wells, quite modern pumps. Villagers tell me a bunch of Germans showed up and put them in place. They have clean drinking water since. Possibly this is why they like me. They are ignorant of my country, but then I tell them my native language is German, and I feel they just think I am bollocking them insisting I come from a place called ‘Autriche’. I also stop in the villages over night. I ask for the ‘chef du village’ for permission, and it has never been a problem. More often than not they offer me a round hut but so far I preferred to sleep in my tent. 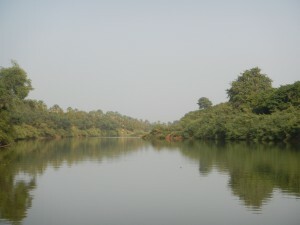 The main reason I prefer to stay in villages is once more the water. It is unlimited there, and I would otherwise have to carry a lot of it into the bush. I can wash myself and cook. However most of the time they offer me dinner. Rice that is, or couscous. The ritual is the men and sometimes the kids come together, everybody wash their hands, the squatting on the floor and eating out of large bowls with the right hand. The left hand is strictly out, since this is the had to clean yourself. It seems there is little going on in the villages. The women are apparently busy with cooking and washing all day, while the men don’t seem to do a lot at all. Mud bricks are produced here and there, and grass is cut to maintain the houses which can get severely damaged during the rainy season. Houses are only for sleeping, all the life is outside. I never get to talk to the women, after dinner, I feel I am expected to sit with the men and drink tea. Probably the arrival of a western traveller here is an event. If we find a common language, they ask lots of questions, primarily about my marital status, but also about what I am doing. I don’t think anybody understands. When Africans make a trip it has a purpose, and they cannot see what purpose I have. The most curious are the kids. Of course we cannot talk, but if I let them and their parents let them, they normally check me out. They want to shake hands then hold onto it, touch the top of my hands, and the forearms, then walk around and touch my hair. At first I offered presents in exchange of staying in villages. Biscuits, chocolate spread, spices. Later on there wasn’t a lot to buy and I offered to pay for my stay. In the end I got a place to sleep, water, food. To my surprise they all declined. My days were simple as well. I got up early, packed up, got on the bike, cycled until the heat forced me off the bike, then, in the afternoon, cycled a bit more and started to look for a place to spend the night. Kita is a town of some size and I stayed there for two nights, for a rest, and to do some housekeeping. The area east of Kita is a little more developed, relatively speaking, with some larger towns. I stopped for a rest when I spotted a shop with a fridge, where I usually bought a few sachets of cold water as a treat. In the absence of electricity the fridges run on gas. My most comfortable night was probably the last one before I hit Bamako. I didn’t see the village but there was something like a rest stop, shacks selling food and drinks to the passing traffic. I sat down for a bit there, tired, then I asked whether I could spend the night there. The village was quite spread out and away from the road. They let me stay in the school. The well was next to it, so the water was unlimited, and there was a concrete floor and consequently no dirt. The headmaster stopped by in the evening to say hello, and that I should just walk over to his house in case I needed something. That particular night the sky was very clear and the star gazing almost as good as back in the Sahara. The night became later than usual, and when I woke up a boy with a bag was staring at me. Dammit. Other than what I thought they told me the evening before, there was school. 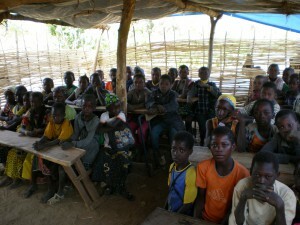 I was packing in a rush under the supervisory eyes of an ever increasing crowd of children, who wanted into the school. I was half way through when a teacher showed up and chased them away. ‘Stupid Toubab’, he probably thought but let me do my thing. The headmaster later gave me a tour of the school. 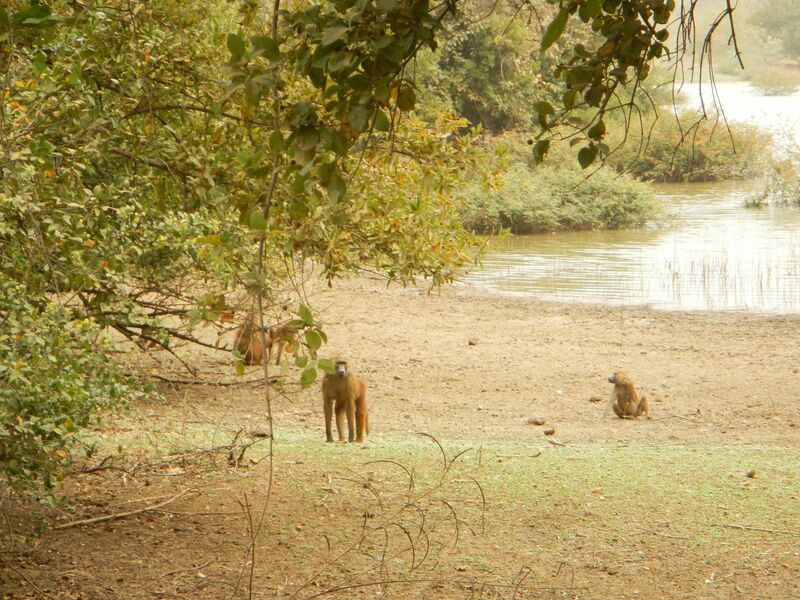 I had a coffee at the roadside stall then headed off, for Bamako or not, I wasn’t sure. Education in Mali is considered the 6th worst in the world, based on what indicators I don’t know. This I thought is pretty much the bottom, considering that there are a few failed states on the planet which naturally rank lower. Primary education is mandatory in theory but this law isn’t executed. They say around 60 % of the kids go to school but this includes the Quran schools run by the Marabouts. The latter is a form of child exploitation rather than education, in the name of religion. Partially due to devoutness, but in most cases probably out of desperation parents give their children to the Marabouts who feed them and teach them the Quran but in turn have to beg for money on the street often under threat of physical harm. 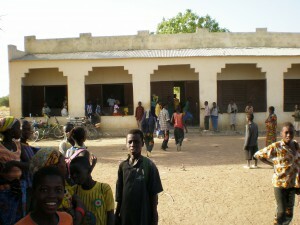 These kids are all over the place in Senegal, particularly in the north. 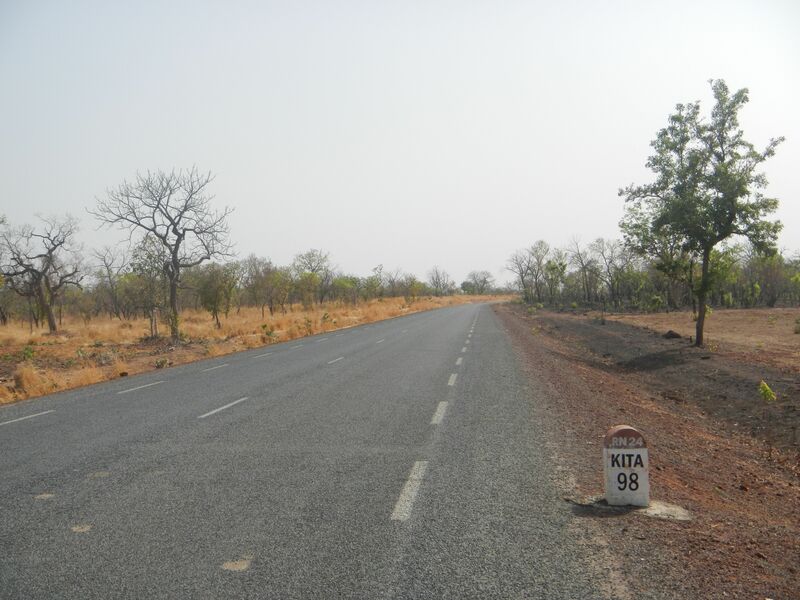 My guess was that it would take me three days from Kita to Bamako purely for the fact that I don’t like to enter big cities in the evening. It isn’t that far. Cities are a pain to navigate, and just in general more dangerous in the dark. The electricity is often not very steady so you might well end up in the complete darkness. 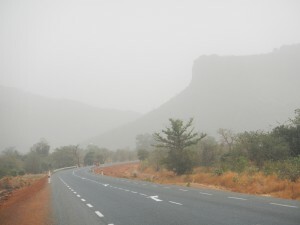 I stopped at a shop 30 km ahead of Bamako at about two in the afternoon. I bought some cold water and asked whether I could sit down for an hour, they always let you. I was offered lunch later but declined the tea since I had decided I would give it a go into Bamako. It was all downhill from there, and I found a hotel well before sunset. I have had a rather bad run since. 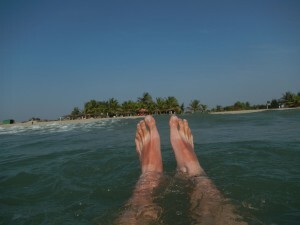 I arrived on a Friday, and since I needed visas that would leave me stuck for two extra days. When I was eating a Mango in the evening something broke off my teeth. It was uncomfortable but at first I thought I could live with it. Over the next day things worsened. I certainly needed a dentist to fix it. My aching mouth ruined the weekend but on Monday I got it fixed. 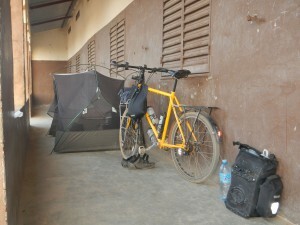 On Wednesday I went to the Burkina Faso embassy on the bike for my visa. It was issued on the spot. When I came back in the afternoon somebody made me aware of the gunfire and shouting in the distance. Over time it came closer. In the evening I learned that there were mutinous soldiers in town, and later that a coup d’etat was in process. The gunfire was audible all night long, sometimes it sounded pretty close. A group of portuguese people who had finished their trip went to the airport but came back later in the night without luggage. Little by little we learned that all the borders were closed, vehicles were confiscated, there was looting and muggings in town. Basically it was unsafe to stray out for too long, and probably impossible to leave the city. Needless to say I have not done much sightseeing of the city, and there are no photos. Sub Saharan African cities are normally rather necessary than enjoyable places, so I don’t mind. I might never get round to do what little there is for tourists to see and do. 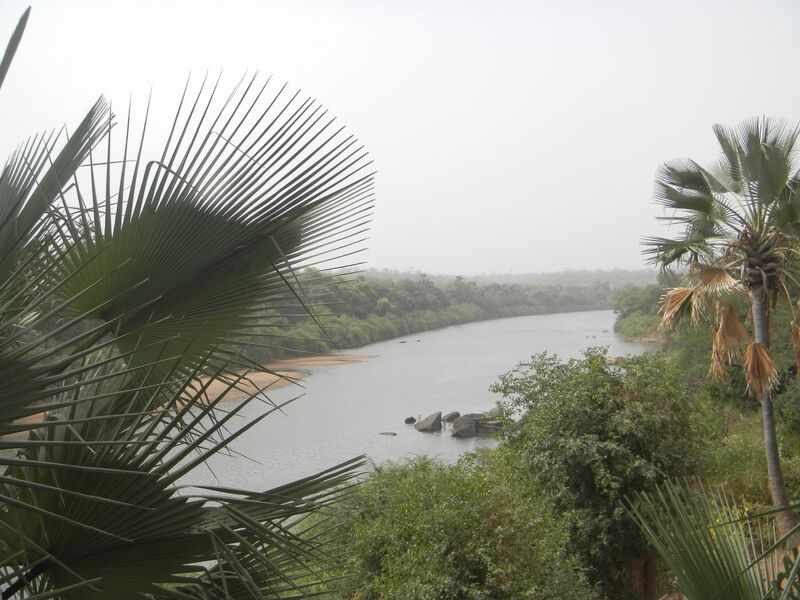 So this is where I am now, stuck in a hotel in Bamako. I am walking out briefly sometimes, for some food shopping or to a nearby pool. Now and then a woman from the German embassy is calling in to give us some information, albeit not much, the situation is unclear. There is little information we have access to and that is to the most part conflicting. I will have to wait and see. During a more substantial excursion to Gunjur, about 50 km from Serekunda I said good bye to the ocean. This is a much less developed part of the beach. Teh day after I hit the road again and continued eastwards, upriver. There is one road on the north bank and one on the south bank of the river, the latter was the one I used. Confined within borders that were clearly thought up in Europe the country has a north to south diameter of only maybe 50 km, or less, following the Gambia river that defines it. Its borders were drawn with a compass at the distance a cannonball could be shot when fired from an English gun located on the river. Whether this is history or legend I don’t know. 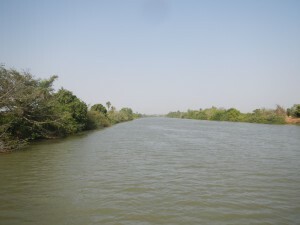 It took me a half day ride to get away from what is essentially a large metropolitan area on the south bank of the Gambia estuary. Here is where most people chose to live. The development of the capital Banjul was doomed from the beginning. It was founded in 1816 as a settlement named Bathurst on a spot that was considered suitable to establish control over the abolition of the slave trade. Population numbers swelled as freed slaves settled there. Its location in the swamps however, and persistent drainage problems make this mosquito infested town an uncomfortable place to live. Most people come in on day trips, but chose to live further west and south along the coast and its hinterland. 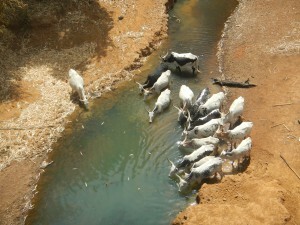 Further on population density decreases quickly beyond the town of Brikama. And another 50 km down the road the pylons continue but the cables they are supposed to carry finish, until the row of pylons disappears as well. I was proud about my early start out of Brikama, but I only made it to the outskirts of town. Rrratsch. My chain was torn. I needed a place to fix it instantly and found the police station which provided some shade and a bench to spread out my things. The policemen were friendly and let me do my thing. After some effort to fix the old chain I decided to put a new one on, but by the time I was finished it approached midday. 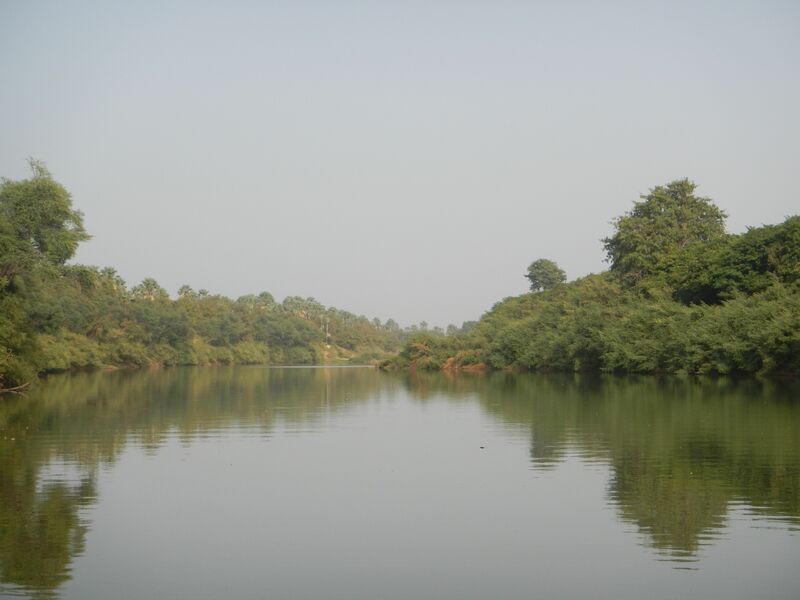 Ideally one would want to travel on a boat to take in the beauty of the river however there is no regular upriver transport. Of course there are tours, but I could not find one that would take me and my bike one way, at a reasonable cost. The road on the south bank is not particularly scenic. 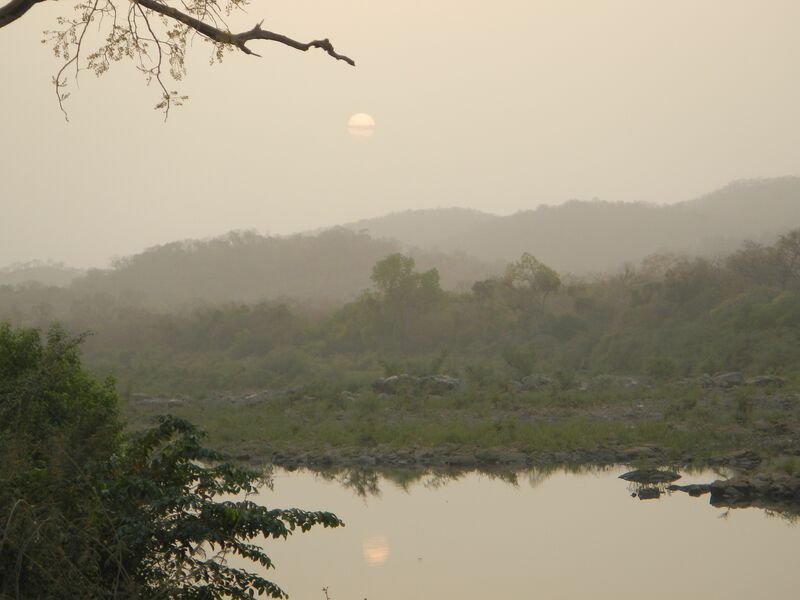 To reveal the beauty of the river and its tributaries one has to go off the road, just about five to ten kilometres north, and there is plenty of opportunity. 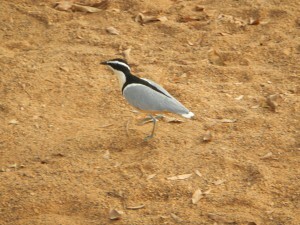 A place worth mentioning is in Bintang, which is located on the Bolong river. 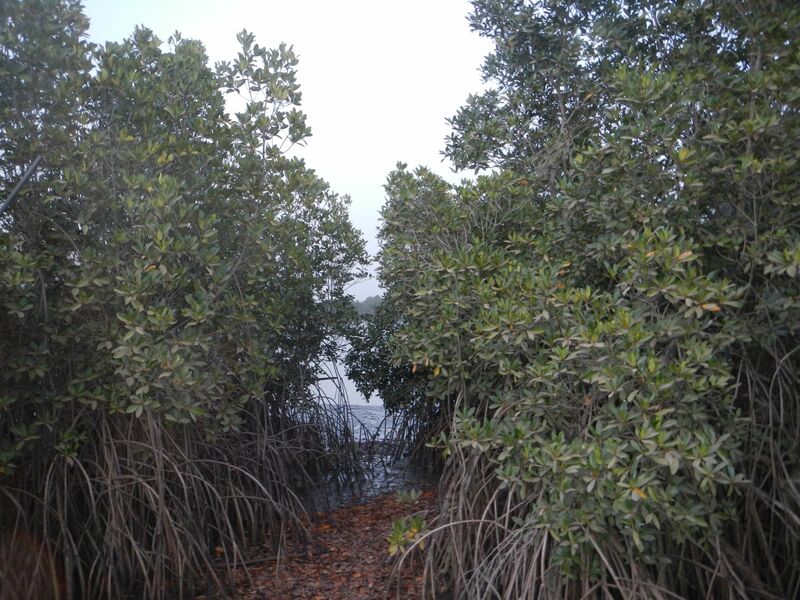 It’s just a few kilometres off the road and built on stilts in the Mangroves. This time the sound was familiar. Just as I hit the main road out of Bintang another spoke broke. Once more I taped it, this time in order to avoid the midday heat, and carried on. The tarmac ended soon after, but a graded road with stones on it was there, the paving imminent, which proved to be a formidable cycle path since cars couldn’t use it. What came after was a terrible ride. By now I have seen a few rough roads, but this one was by far the worst. On a bike, you only really need 25 cm of reasonable surface which is often there on the edges, but even this was rarely available on that road. It was corrugated at its full width, with plenty of potholes, some filled with deep sand hence barely visible. Needless to say I got worried about my back rim, as I negotiated this road slowly, but with considerable stress. 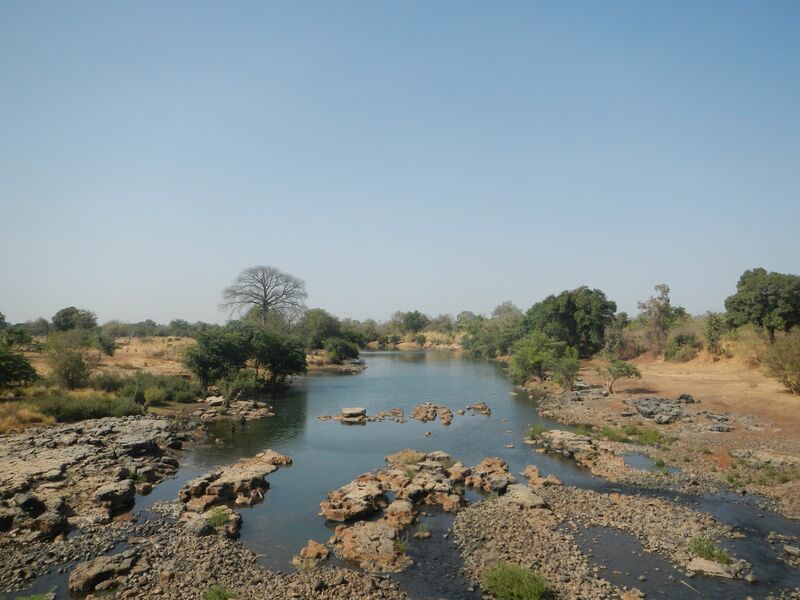 I consulted my guidebook for a nearby place to stay, and to replace the spoke and ended up in a town named Tendaba, right on the river, where a big camp for birdwatchers was located. It was not a place where I would have chosen to stay, but I was physically and mentally exhausted and then, they only gave me one night anyway. It was too late to either carry on or start fixing my bike and exhausted I went to the bar for a coffee and to contemplate how I would continue on this terrible road with my broken spoke. A man shouted over a few tables and asked how the ride was. They had seen me up the road earlier. 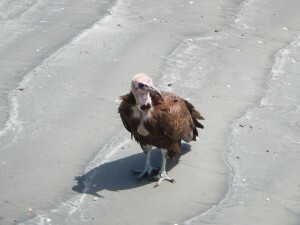 I walked over and said terrible, and started whining about my day, and the second breakdown in two days. This is how I met Paul and Axel, two expatriates living on the coast, a Brit (he sounded very English, but insisted he was a Scotsman) and a German (upper Bavarian, and I was delighted to hear familiar speech). Paul’s not closer specified court case was dragging on and Axel’s restaurant was out of business, so for some time they had found themselves doing little by day and drinking at a bar by night. To break this pattern, they had decided to go on a trip upcountry and get drunk in less familiar places. After some chatter they offered my a lift and I accepted to avoid the bad road until I could fix my spoke. Cool, I thought, sometimes problems go away that quickly. I went for dinner while Paul and Axel went for more beer. In the morning I loaded the bike up on the roof rack but my new friends had a flat tire so they changed it and needed to replace the spare tire. While watching the guy in the roadside garage replacing their tire I thought to myself, this is why I don’t want anyone near my bike. In the absence of good equipment there was just brute force at work. We got going only by midday. 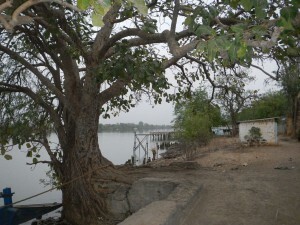 They took me all the way to Janjanbureh where we checked into a place. I did my washing while Paul and Axel went for a walk. I found them later in a bar not far from the hotel, with sixteen empty beer bottles on the table. On the last Saturday of each month the Gambia holds Set Settal, or Operation Clean the Nation. It is a program aimed at bettering the rubbish problem and most businesses and schools close to foster cleaning of trash around compounds and in public areas. Transportation is entirely halted, including private cars and taxis, and enforced by the military. That morning I fixed my wheel. Paul and Axel were stuck until midday and had a few beers to kill the time. At one we gave our farewells and they headed off. I did a bit of sightseeing when I took the fixed bike for a test ride in the late afternoon, the other colonial town in the country I thought might have some appeal. At least, until recently, it was named Georgetown, is located on an island in the river. 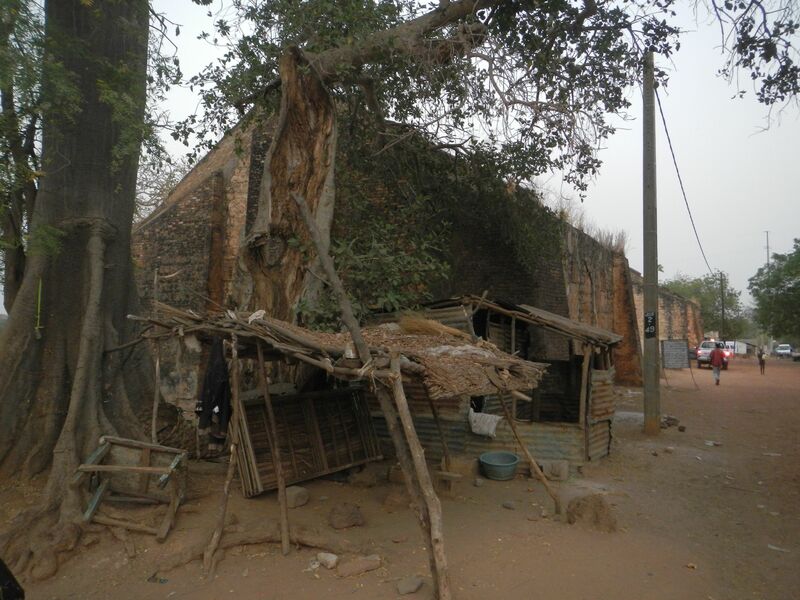 There are some historically looking structures, half broken down that they try to sell as a slave house and a slave market but were in fact constructed well after slavery was abolished. The story doesn’t add up and is probably fiction. I was rather disappointed with the place. It is very visible here, at a town of some size, that the power had stopped some 200 km ahead of there. By sunset a few generators come on and strangely light up a limited number of shops, bars and hotels, some lights here and there in the otherwise pitch black Janjanbureh night. The easternmost border crossing I had found was near Basse Santa Su where I headed the next day. The road was good but the police got annoying. On a stretch of no more than 30 kilometres there were five roadblocks, each seeking trouble and trying to extract bribes by asking for the ‘mandatory license’ for my bike and one policeman even claimed it was an offence not to carry a fire extinguisher. They were all fairly easily sat out however over time I have to admit I got very annoyed. I found a place for the night in a private house what is probably best described as a bed and breakfast place. I was sitting over dinner when the proprietor fetched some water and said he was going for prayer. I had forgotten about the 7 o’clock prayer and said, this time? So we chatted about prayer times for a minute, before he asked ‘Are you interested in Islam?’ ‘Yes’ I answered, meaning I like to learn and understand. ‘We can have a wander down to the mosque later and you confess.’ Oops, that was a bit quick, I thought. Later, sitting out on the street my host gave me a lesson which was quite interesting, and I found out he was the Imam. Later the chat drifted off to more mundane topics. I heard the rats in the ceiling when I retreated to bed and hoped that they would stay there when I fell asleep. I woke up in the middle of the night and when I switched the light on a few of them were running away. In the entrance hall I saw someone sleeping on the floor. Strange I thought, but went for a pee and back to sleep. The next morning I got up early and found some rat droppings, my plastic bags torn and my bread half eaten. Out of the room I saw who had been sleeping on the floor and that was the landlord and his wife. Weird, I thought, renting out rooms and sleeping on the floor in the hall themselves. The road to the border was extremely rough, or, it wasn’t really a road at all. The ten kilometres to the border took me two hours, where I got half an exit stamp because they had run out of ink, another hour of pushing across no man’s land, and I was happy to enter back into Senegal. 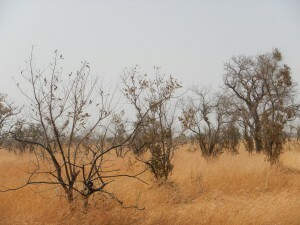 Gambia, or the part upcountry had been a bit of an effort. Primarily because of my breakdowns I guess, that left me in an unusually short fused mind set, but partly because I found circumstances more difficult than before on this trip. There is such stark contrast between the sparkling beach resorts in the west and the rough roads, corrupt police and lack of basic infrastructure upcountry. No major problems, all in all, but it came unexpectedly to me and it is the big contrast in such a small country that makes it strange. Since my French is strictly limited (and by then it wouldn’t have taken much to catch up to a similar level with Wolof) an ‘anglophone’ country was of course a plus. However I had the impression that the level of English most Gambians speak is significantly lower than the level of French they speak in Senegal. What was certainly not a problem, in the wide absence of taps, was the availability of water. Most is coming from communal wells (that is Saudi pumps on top of German boreholes) and you just stop in a village and fill up. Easy. And the quality is better than from the taps earlier. After no man’s land it was back to familiar territory. The immigration process was easy, ‘Bienvenue en Senegal’, said a not overly stressed policeman lying on a bench in the shade obviously happy about some distraction. He served me a mug of water while he went off to stamp me in. In a joint effort we put some credit on my mobile phone which he had given me in exchange for my Gambian sim card. The road remained rough for another nine kilometres to Velingara before I hit an excellent tarmac road again and it was seemingly all downhill for the hundred kilometres to Tambacounda. It was the day after the elections that I entered Senegal for the second time. Was that a smart move? Well, I had thought about this before. 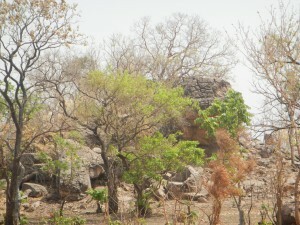 However the part of the country I entered is a lot more remote than the coast, and even if the outcome had sparked violence in Dakar, I deemed it was highly unlikely that these few backvelders here would start clashing with the authorities, or setting their grass thatched mud brick round houses on fire. As well, had there been trouble, they would have probably told me at the border. To bring the story about Senegal politics to an end… In Senegal, like in France, or in Austria, or many other countries where the president is determined by general elections, a candidate needs to achieve more than half of the votes. Neither of them did so there will be another round, when I don’t know but it will be well after I will have left the country. I do my trip in sections, meaning, I only plan ahead so far and lay out particular stages. 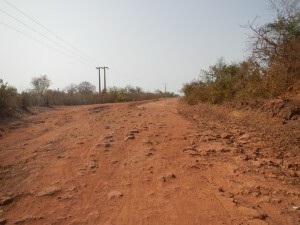 Tambacounda was the end of a stage, and when you look on a map you can understand why. It is a big junction town, where many roads come together. The next stage is from there to Bamako. 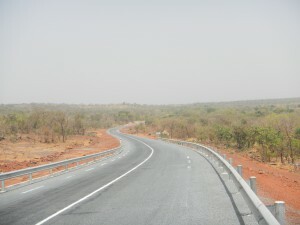 There are several routes between Tambacounda and Bamako. The most obvious is the big road from Dakar, which is unappealing as probably all the lorries transporting goods from the port in Dakar further inland use it. The upside of course would be that one can safely assume it is a good paved and well travelled road. From Kayes another road branches off and continues south-eastwards from there, roughly along the Dakar-Niger Railway line. That area I hear is fairly scenic, but the road is not as good. The appeal however being that in case I lost interest, I could load the bike up and continue on the train. 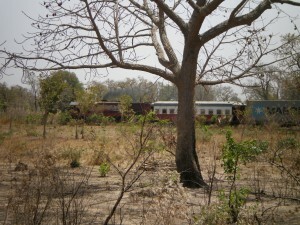 The Dakar-Niger Railway was something of a traveller’s classic. After decades of underinvestment and the degrading of tracks and rolling stock passenger service has come to a halt recently after an accident on the Dakar to Tambacounda section. Freight trains are still running on the line, as I could observe in Tambacounda, so this accident might just be a convenient excuse for the Canadian operator to delay major investment. Anyway, the dream is dead, for the time being, but passenger trains are still running between Kayes and Bamako hence the mentioned developments would not restrict any of my particular travel plans. 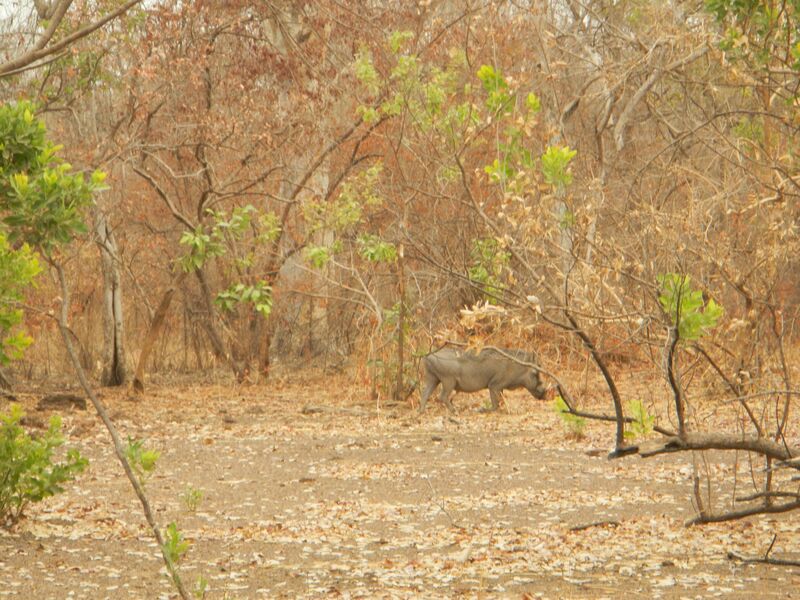 The third possibility was to go south-eastwards through the Niokolo-Koba park, Senegal’s major National park and further to Kedougou, from where I would find a way into Mali. 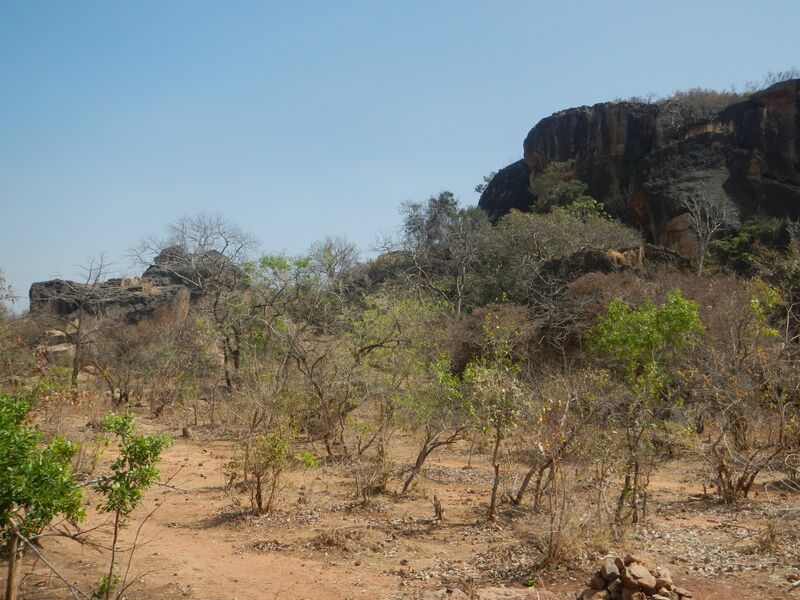 It seemed the most interesting and safest, albeit possibly also most difficult route, since maps were quite contradictory on the roads in the area. Rich’s comment on my previous blog post convinced me otherwise, he had found a new road connecting Kedougou and Kita, so my preferred route seems easier than expected and the decision was made. 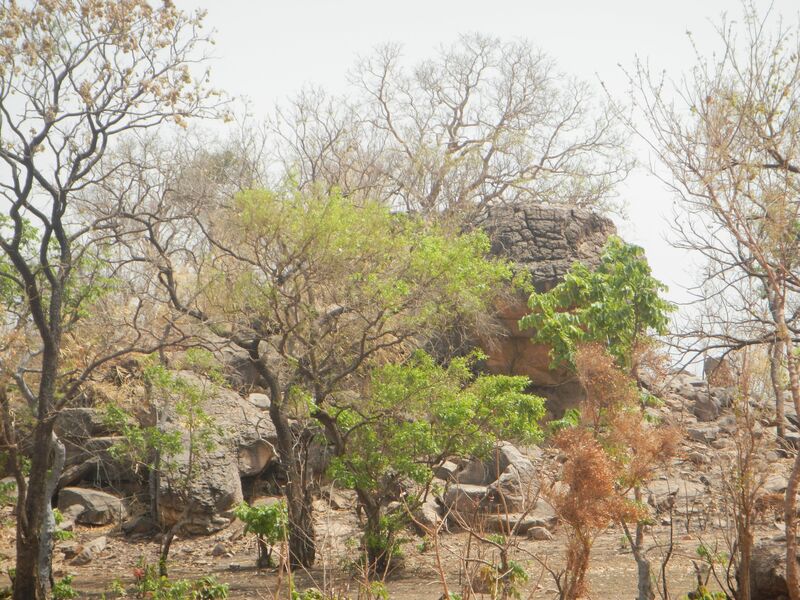 I left Tambacounda after a days break on the Route National 7, that cuts through the Niokolo-Koba National Park. I didn’t get much further than 70 km though, at the Dar Salam gate I was turned away, no entry, and no traverse on a bicycle. I should have inquired beforehand. I headed back to Wassadou, where I booked a prohibitively expensive tour of the park, and they would set me off in Mako, on the other end of the park, in the evening with my bike. We headed off early. 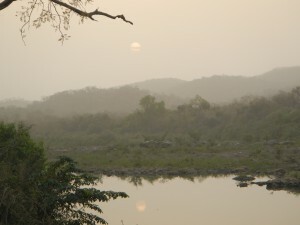 This is Senegal’s premier national park comprising 9000 kilometres squared around the Gambia river and its tributaries, the Niokolo and the Koba rivers. It is inhabited by a number of big mammals. It doesn’t seem to be crowded with tourists, the whole day we saw no other vehicle. 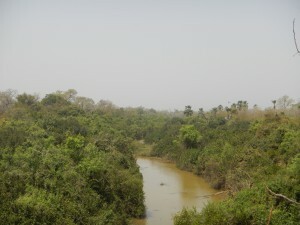 The landscape is pretty, with dense woods, Savannah and bamboo tunnels. 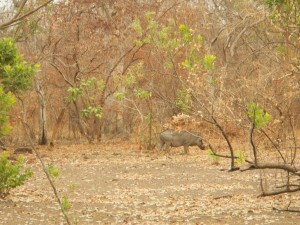 I saw monkeys, baboons, warthogs, bushbucks, cobs, hippos and crocodiles. There are also lions, leopards, and elephants in the park, but those are only seen about once a year, it’s very few of them. 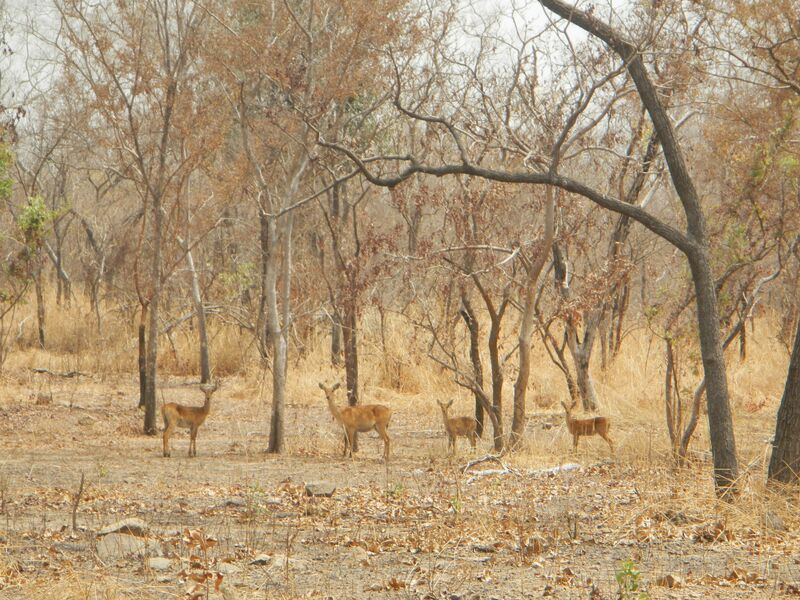 Poaching is a problem, and, albeit nobody said this explicitly, I got the impression that the few park rangers are not greatly interested in patrolling the more remote parts of the park. It was a nice day out however it is no comparison to the parks in southern Africa. 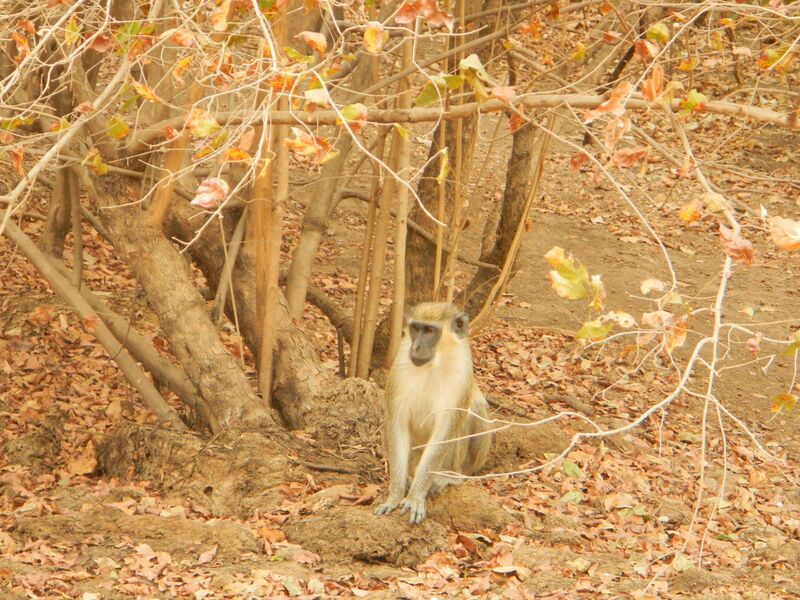 Animal sightings here are infrequent and most of them are not the more exciting ones one would expect in Africa. None of the kitties I was so throughly warned about when they denied me entrance to the park I could see. Further more much of the area around the roads was burned down. I was told this is done on purpose as a safety measure, as fires would be difficult to control in the dry season. 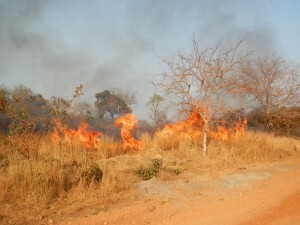 Well, what do I know, but I wondered about the ethics of conservation, if parts of the park are set on fire on purpose. On that note I saw several bush fires along the way. 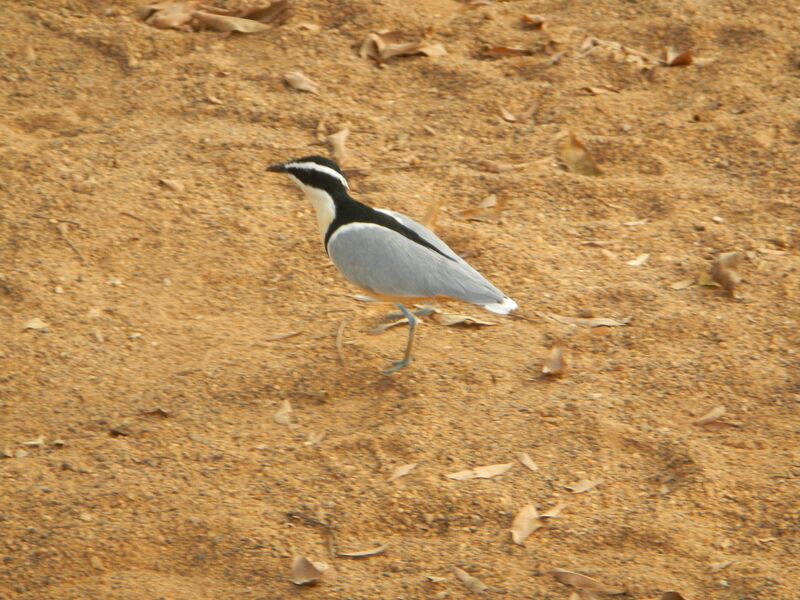 These sightings started in the Gambia, and continued in eastern Senegal. So far I could not figure out whether the grass is set on fire on purpose or by accident. I never saw people trying to extinguish them, in fact I never saw people around the fires at all. 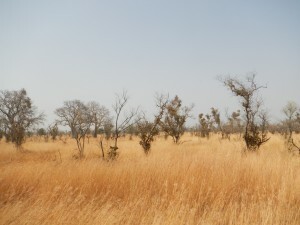 Otherwise, in general the Savannah looks a fair bit healthier here than further north and west, where large herds of goats and sheep roam the rather bare and sandy land where only patches of very short grass remain left. 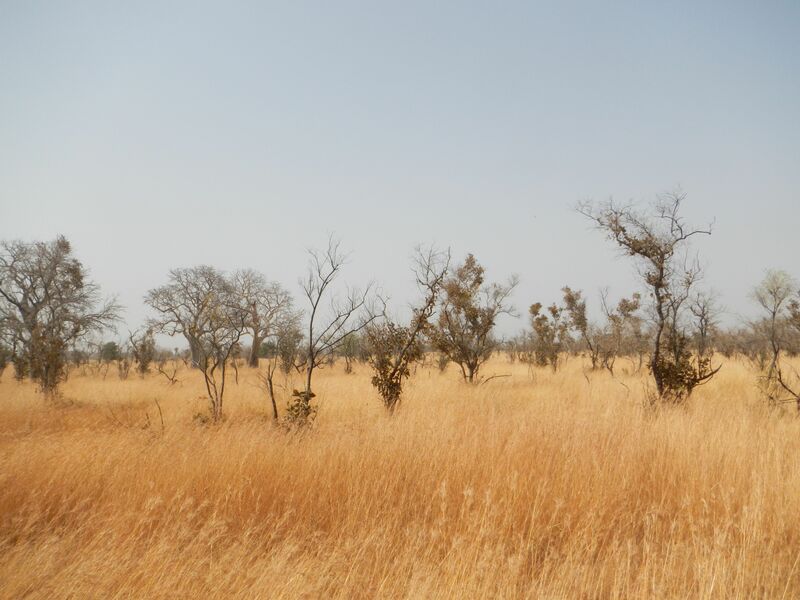 Presumably a population that grows at a tropical rate consumes an increasing number of animals which in turn consume more grass, boosting desertification in the fragile Sahel where a sufficient food supply is so dependent on the scarce and unreliable rains. But what do I know? Those religious about ‘global warming’ will have a different diagnosis for the problem. When you move up any river in the world, you invariably end up in mountainous terrain. And the ride to Kedougou was some of the most scenic, surrounded by the majestic hills, some nice bush and the road crosses the Gambia river several times. Over night I stayed on the banks of the river a lot, and regularly saw and heard the hippos which seem to be all over the place, and the occasional crocodile. It is a really attractive part of the world. Other than expected I am still rolling on road tires. There were sections that I had wished for wider ones, particularly between Basse and Veingara, as well as further up between Toubacouta and Karrang, or just after Gandiol. None of these sections were however longer than 70 km, so I never considered it worth the effort changing the tires. On that note, my original tires, the Panasonic Tour Guard, were a disappointing piece of equipment. One ripped after less than 3000 km in the Rif Mountains, and I replaced it by a cheap chinese nylon tire. It doesn’t fit perfectly and wobbles a bit when fully inflated, but I think it was me who screwed it, never fold a tire that isn’t foldable. However by now it has made over 4000 km on worse roads already, and there was only one puncture. On a different, but still technical note… I had two broken spokes in relatively short time and I have the nasty feeling it was not the last one. I have no idea why spokes break, so I don’t know what to do to avoid it in the future. If anybody has an idea, please get in touch. 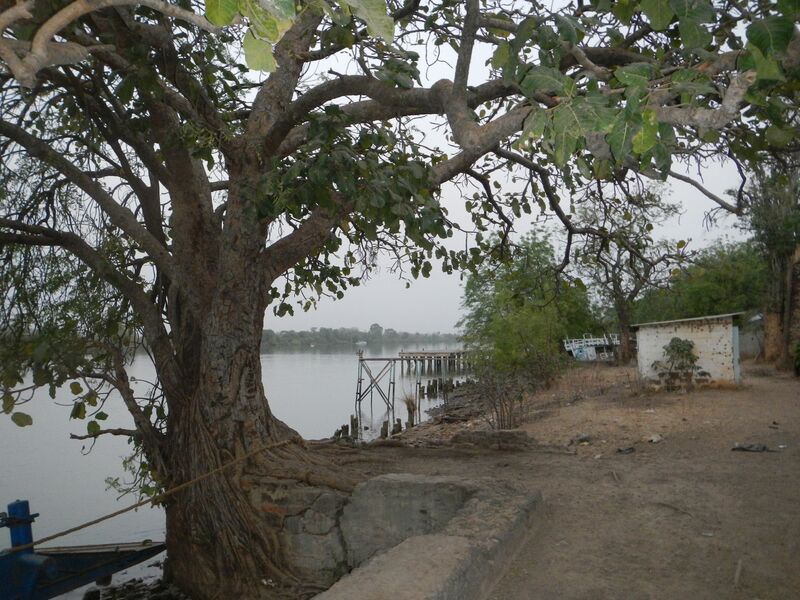 The last city of significance in eastern Senegal is Kedougou, where I am typing these lines. It’s hard to believe though, as this is a collection of traditional houses and dusty roads, with little infrastructure. 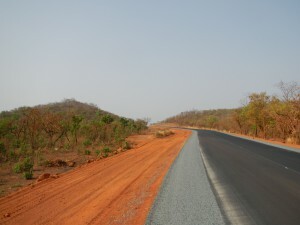 From here I will find the sparkling new road, and will head further eastwards towards Bamako.